First up, baby oil and water. This one is really simple and one of the coolest options. I just used the little travel sized bottles of baby oil from Dollar Tree for these two--just dumped one whole little bottle in each. 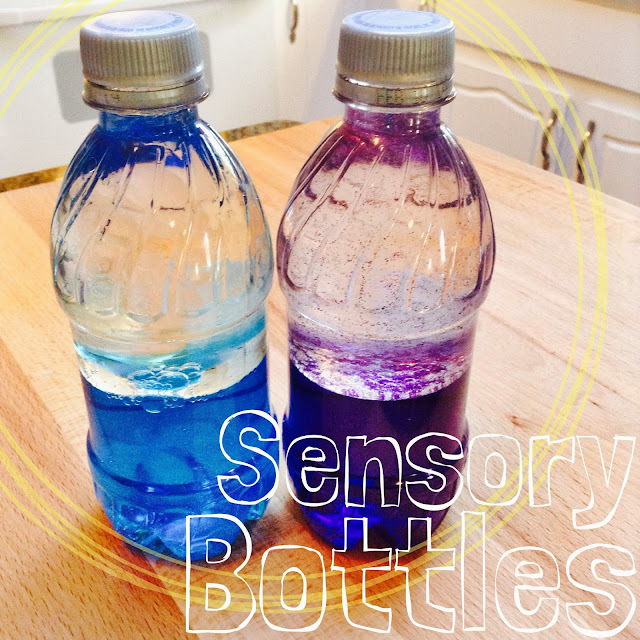 If you have a big bottle of baby oil already, just fill your sensory bottle up about halfway. Then, fill it all the way up to the very top with warm water. 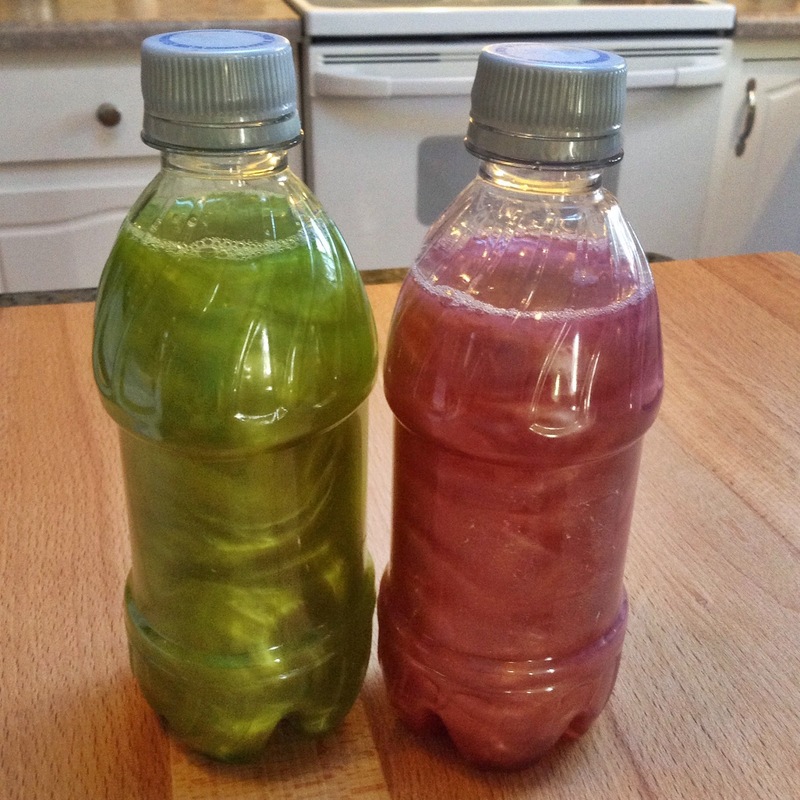 Warm water helps the food coloring dissolve better. I got such bright colors by using the gel food coloring again. I love that stuff--makes everything twice as pretty. I always used liquid food coloring at daycare and it worked just as well. I added glitter to the purple one and you can't see it very well, but the glitter got suspended in the oil which looks really cool. I've tried using vegetable oil instead of baby oil, and it works, but doesn't look nearly as pretty. Okay, next up is soap and water. This one is super simple, too. 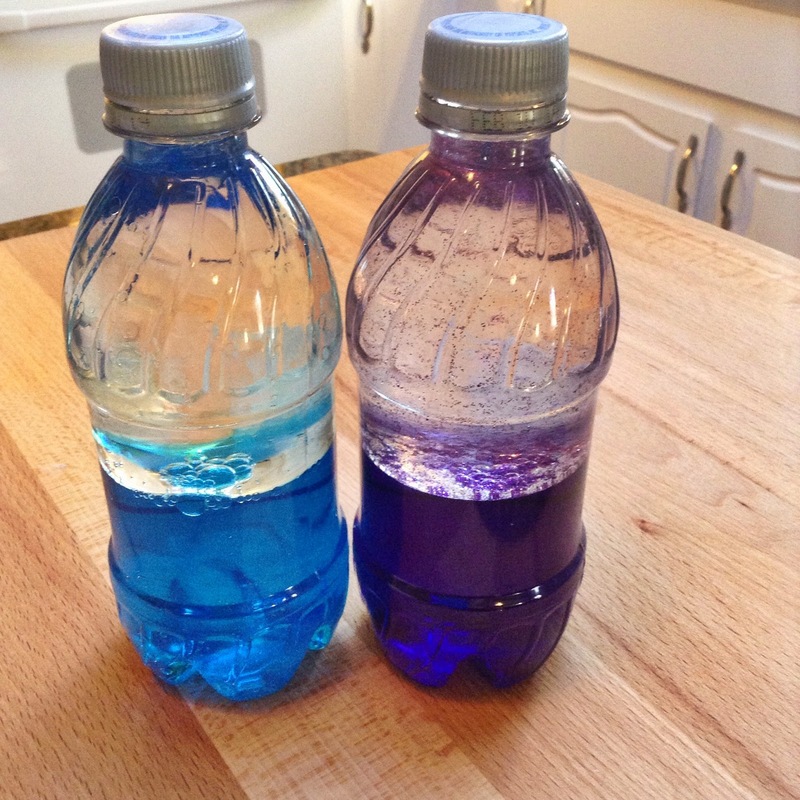 All you need is dish soap, liquid food coloring, and water. Just fill the bottle up halfway with water, squirt in some soap (maybe roughly half a teaspoon?) and a few drops of food coloring. Liquid food coloring will work better for this because there's no way to get your toothpick full of gel coloring down to the water. That's it! Just screw on the lid and give it a good shake. This one is also good for shaking and watching what happens. What kiddo doesn't like bubbles? On to the next one...watered down hair gel with glitter. Just fill your bottle 3/4 of the way with cheap hair gel. I used some from Dave's ginormous economy sized bottle that he's had since I met him 10 years ago and he didn't even notice. I added the glitter next. I've found that the best glitter to use if you are going to be letting it sit in liquid, is the super fine craft glitter. 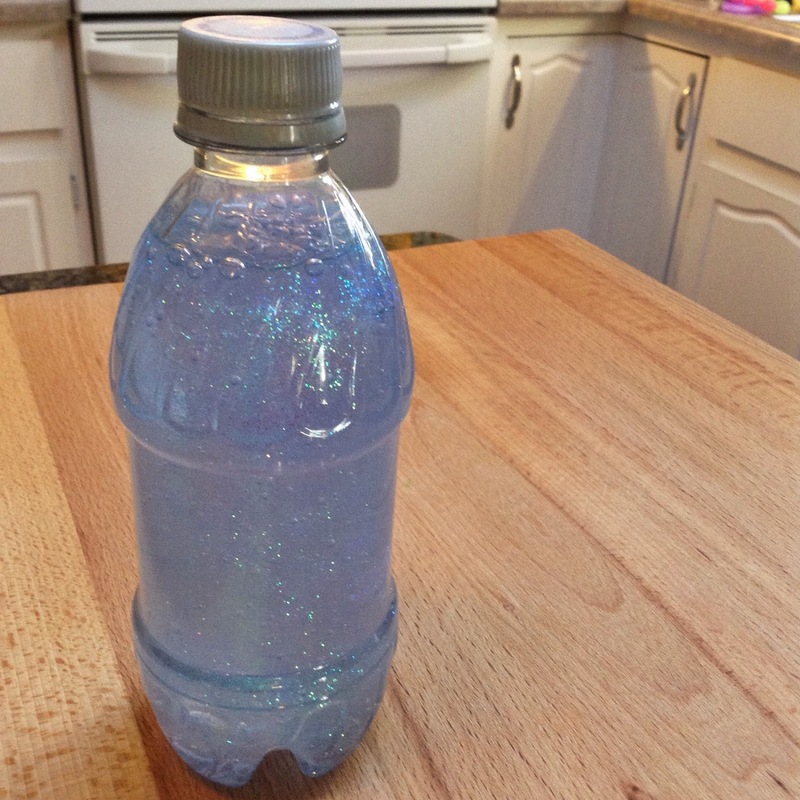 The chunkier school glitter looses it's color and turns everything inside the bottle the color that the glitter used to be. All that's left is to fill it up with water and toss in a marble or something heavier like that. The point of the marble is to stir up the glitter and also lets your kid see the how it takes longer for the marble to cut through the hair gel than it would just plain water. This bottle looks really neat, is fun to shake, and teaches a little bit about viscosity. Let's talk shakers! You can get really creative with these. I just took a walk around my craft room and looked in the kitchen cabinets to find the stuff for Kinley's. She's got one with pretty buttons leftover from a craft I made for her room (this one is her all time favorite sensory bottle), Kool-Aid rice (I'll try to find the recipe and share--really cool sensory thing for kids who won't try to eat it), couscous, and tin foil torn into little pieces. All of them make different sounds, and she loves them all. Just use whatever you've got on hand for these...so many possibilities. 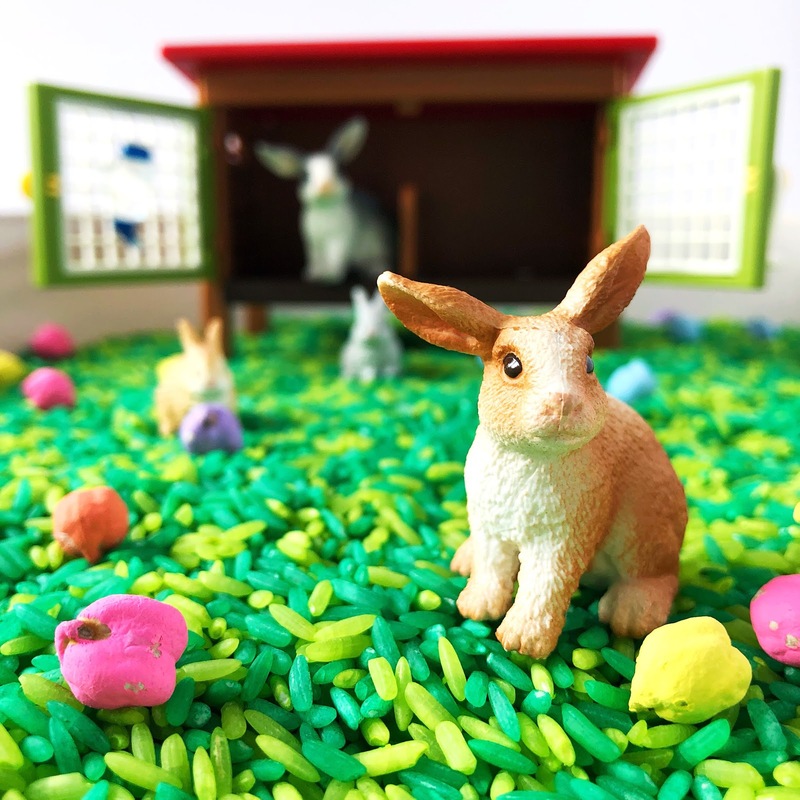 At daycare, I made them with sunflower seeds, birdseed, beads, pasta, pom poms, googly eyes, cut up pieces of that plastic lanyard string, just basically whatever. The last one for today is the cool swirly shaving cream and water sensory bottle. My old work friend, Alisha, taught me about these gems. They are so pretty and hypnotizing. These are definitely the trickiest to make. The easiest way to do this is to use a Gatorade bottle because their mouths are so big. 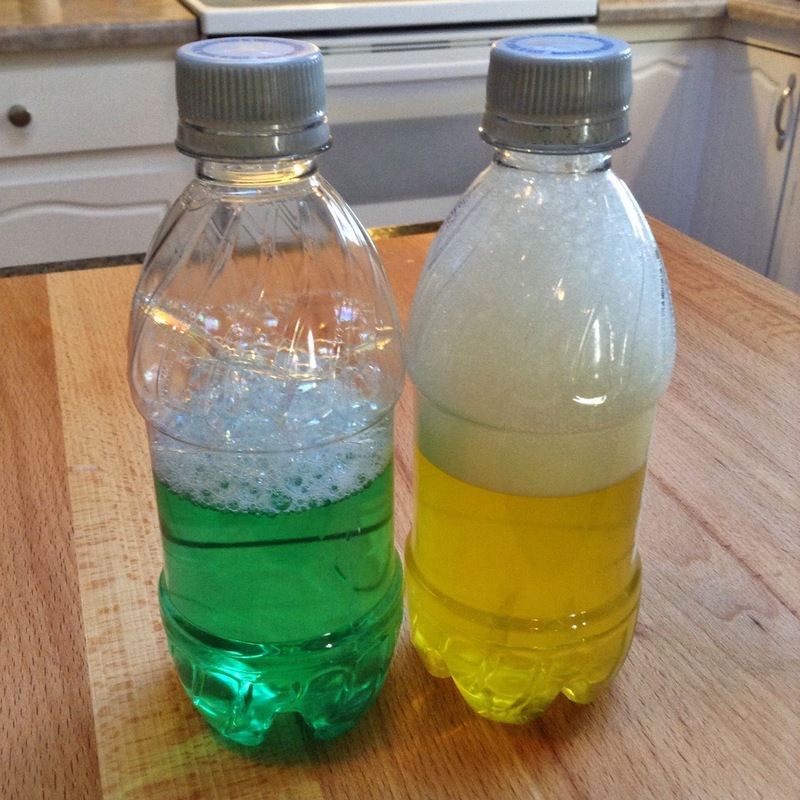 Just use the regular old-school foam shaving cream, not gel, and squirt as much as you can fit in the bottle. Add a little water, screw the cap on, and shake. Leave it to settle for an hour or so, until you see more room at the top to add more shaving cream, and repeat the process. This all sounds easy enough, but it's super messy and a little frustrating trying to get the shaving cream to stay in the bottle cause it wants to expand so much. I don't know how to tell you how much shaving cream you need to put in there because I just did it for a few rounds of filling and waiting and stopped when I got ticked off. The more shaving cream you manage to stuff in the bottle, the more swirly and awesome your bottle will be. Good luck! The frustration IS worth it, I promise! Once your shaving cream has all settled, you can just fill your bottle the rest of the way with water and add food coloring. Now, you've just gotta keep waiting and shaking. Usually, they go through an awkward period where they look totally gross and you will definitely think you screwed up or didn't add enough shaving cream, but don't worry, you did. After 2 or 3 days, magic will happen and they will suddenly be awesome and you will be so happy you messed with it. That's all I've got for you today. 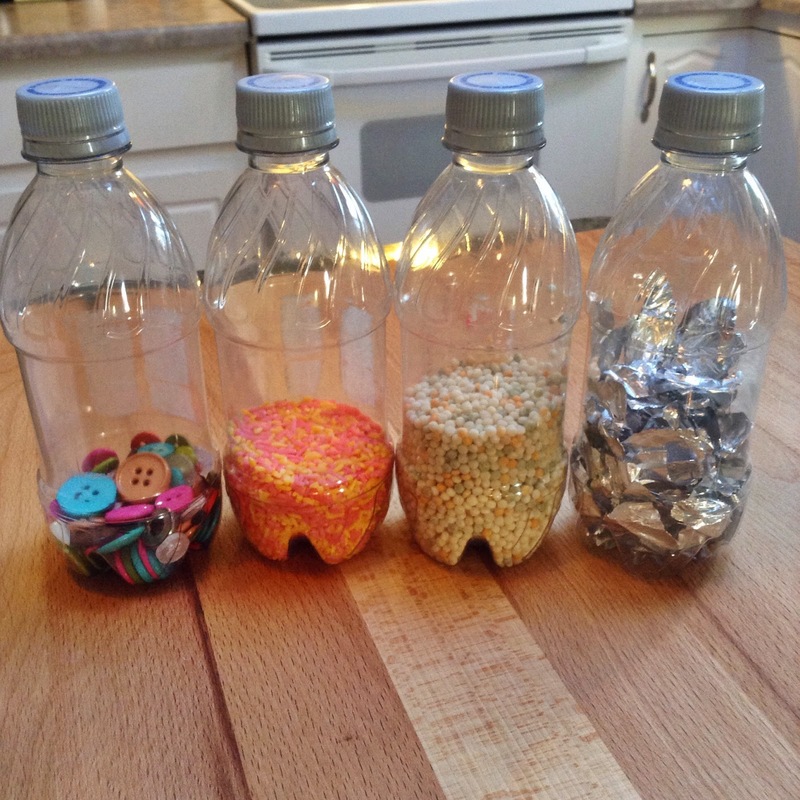 I used the tiny Diet Pepsi bottles that come in the 8 packs for all of Kinley's, but you can use any kind of bottle. I wouldn't recommend using the thin plastic water bottles because they are too easy to chew through and they crush really easily, too. I definitely don't want you to have to scrub hot pink corn syrup or hair gel out of your carpet if a sensory bottle gets stepped on. You can get really creative with sensory bottles. Sometimes I just wander around the Dollar Tree or the Target One Spot looking for cool stuff to put in them. And just think of all the random stuff that's already in your house that you could use without spending a penny. 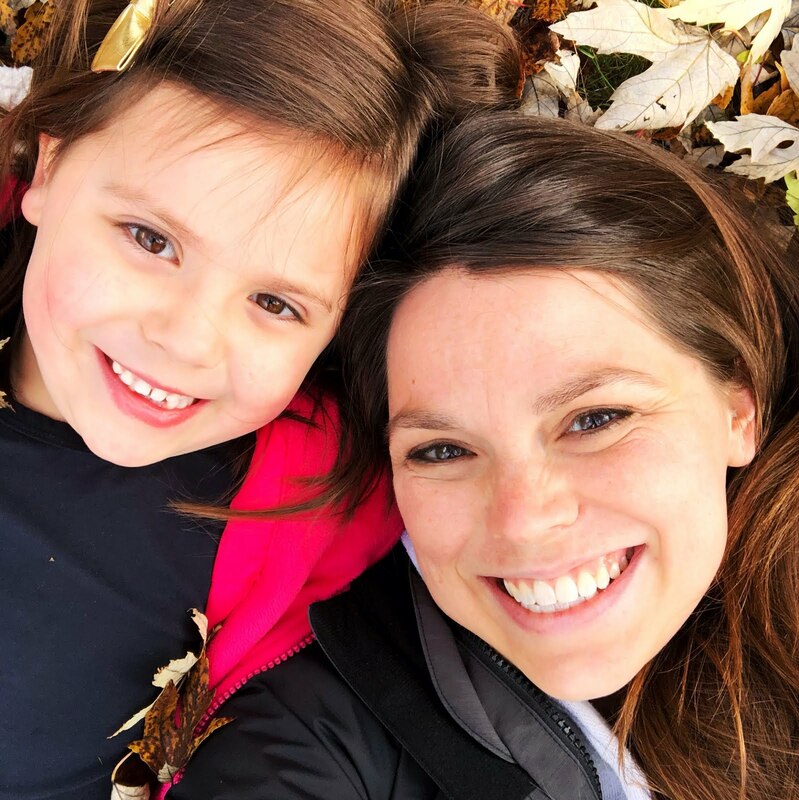 Have fun and try everything that comes to mind. If it isn't cool, you can always just dump it and try something else. I almost forgot to tell you, if you think there is any possibility of your child being able to get the bottles open, make sure you hot glue or super-glue the lids on. I will do another post about more of these if you want...just let me know :) or if you have any questions about making the ones I told you about, of course.